Just what is Beck? After watching it I can conclude that it is one stereotyped anime about Americans living in Japan. More to the point, about a indecisive boy that decides to join a band. The story is decently linear and the songs are good, but I just couldn't contain my laughter at the various misconceptions thrown in. Beck is an anime about a band that struggles towards fame. Along the way they meet many different problems which they must overcome. As such we get to see the hardships and heartbreaking moments for each member of the band. The story is quite linear as the character starts off as a total newcomer in playing the guitar. After overcoming some fears and problems, he starts to get serious about playing and eventually becomes quite skilled. Of course, his attitude changes after meeting and joining the band as decides that music is his life. The ending was excellently done that left a satisfying conclusion to an entertaining series. Honestly, the art wasn't that spectacular. I think the animators only solely focused on the band playing scenes rather than the overall picture. The detail on the guitars were great and the strumming movements by the band members were quite realistic. Apart from that, everything else lacked fine detail that left me quite disappointed. The art took too long to get used to and it had too much of a 'western' cartoon feel to it. Whether this anime was animated by a western studio would come as no surprise to me, if it wasn't then I must say it was just too stereotyped. I had mixed reactions to the soundtrack and voice acting throughout the anime. The voice acting was decent overall but I seriously could not stand the English that the Japanese characters spoke. Even the American characters which probably had English voice actors sounded really stereotyped. The dialogue was just 'urgh'. Terrible. So bad that I found it hilarious to watch. Even though I don't like in the US, I could still tell that it was pretty stereotyped right from the start. The singing wasn't all bad but the English conversations between characters just put me off. At first I could not tell where the story was situated in, but then I came to realize it was in Japan and not in America at all. The main reason why I was confused was that the anime showed a lot of 'foreigners' in Japan that spoke English- including the main characters. Thus I was confused at the time and place the story was set. Yukio wasn't all too bad as he mainly stuck with Japanese and his English is very limited to only a few broken sentences. You get to sense pity for him as he deals with everyday life in and out of the band. There were lots of other characters which had different personalities more skewered to the American way of life. You may find them hilarious or just downright stupid. Overall, I liked the story and the music but I just couldn't stand the voice acting. Yes I know its a Japanese anime with American references, but why did they have to use American stereotyped characters in it? 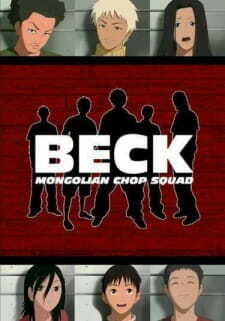 Beck is onle of those anime that you will have to take as a grain of salt. It's enjoyable enough to watch to the end. It is funny in many different ways. If you don't mind the cheesy dialogue then its a good anime to waste some time on. Pretty generic and linear. There are some surprising events that will keep you entertained. Disappointing art presentation overall. Lack of textures and fine detailed ruined the experience for me. I just could not stand the stereotyped and cheesy dialogue. Really? Do all Americans sound like that? Music was decent though. Wide range of characters both from eastern and western origins. It was funny to watch them converse with each other. It was enjoyable to watch to an extent. If you are into rock bands and such. I felt that it could have been way better if they fixed up the art and character representations.